One of the cheapest ways to explore the many places is the backpacker bus that combines flexibility with comfort as an independent traveler to follow the tour. How, by buying a ticket to a predetermined route and tourists just follow suit or casual rhythm abd fast trip up to you as the ticket is valid for 12 months. Now travelers can choose to stay on the bus all the way and stay in several different cities during the course of the route, or a longer stay in one place and boarded the next bus. When the holiday season, some buses may be full. Most companies do operate throughout the year, but the departure was reduced during the winter. Focus backpacker bus trip is to experience in New Zealand, not just move from one city to another. By riding the bus travelers can also do activities like hiking, bungee jumping, and others. If you make a reservation early, chances travelers get the price $ 10 cheaper. And, if you have a membership card backpacker accommodation network such as the Youth Hostel Association (YHA), Budget Backpacker Hostel (BBH), and others, you also get an additional discount. This ticket does not include accommodation and activities, although usually if you buy these tickets, travelers will get a discount for ticket activity. The following are some operators who operate buses backpacker. Flying Kiwi Wilderness Expeditions has a route that is suitable for the adventurer who enjoyed the beauty of nature. This bus will take passengers to areas outside the tourist track and offers camping in nature as accommodation. Inside the bus there are a variety of equipment such as canoes, bicycles, bed, refrigerator, hot shower, and others. Interestingly, all passengers share the task of preparing food and other daily tasks. And, unlike bus hop-on-hop-off other, bus tour makes you meet the same people for a long time. There are several types of packages are offered, depending on the interest of passengers. For example, if fond of beaches, Beach It Tour packages available starting from Auckland to the Bay of Islands. The tour lasted for 4 days with tent facilities, food, camping fees, and transportation. This package price of around 534 NZD. 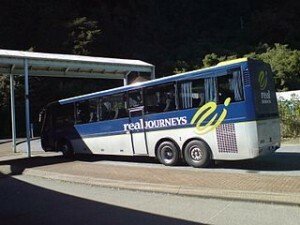 There are several bus departure point is in the big cities, namely in Christchurch, Wellington, Auckland, Picton, and Taupo. Kiwi Experience is suitable for pleasure seekers, usually young people who like to party. This bus has a good reputation. However, the operator of this one does offer a lot of travel package options. Short trip package is divided into 3 categories: 1-5 days, 5-10 days, and 11-15 days. Package 1 day to Waitomo Wanderer 85 NZD appreciated. While 6 day package and Lake Rotorua from Auckland appreciated 370 NZD. don’t forget to check the special offers on their website because in addition to a different package deals, rebates are also quite large. Some points of departure Kiwi Experience from several cities such as Queenstown, Taupo, Franz Josef, Rotorua, Wellington, Auckland, Christchurch, Kaikoura, and Wanaka. Stray has a reputation that is almost the same as the Kiwi Experience, the party bus. Examples of travel packages offered in the North Island is Jack Pass, during a 2-day tour that will take passengers from Auckland to the Bay of Islands with many stops during the trip. Tourism activities on offer such as glass bottom boat in the Bay of Islands, Snorkeling free, hugging the giant kauri trees in the Parry Kauri Park, and visit the Native Bird Recovery Centre. This package price about 105 NZD. Some bus departure point of a big city like Witomo, Base Hot Rocks, Bluebridge Ferry, Urban Retreat, Base Wanaka, Rainforest Retreat, Wellington, and Discovery Base lodge. Magic Bus is the largest bus operators in New Zealand backpacker which ensures the availability of seats by booking at least 24 hours in advance. Travel package options are also varied. Interestingly, given the YHA card holders discounts. One of the packages offered is the Spirit of New Zealand that will take passengers around New Zealand for 21 days. Ticket validity period is 1 year with a package price for 1399 NZD. Nakedbus a bus operator which enforces system first come first serve, namely the faster make a reservation, ticket prices more affordable. Other than by way of advance booking, savings can also be done by purchasing a pass card, which can be purchased based on the number of trips. For example, if for the package 3 places, travelers are advised to provide a holiday for 7 days, at a price of 99 NZD. To 5 locations, travelers should provide a 9 day vacation, with a ticket price of 151 NZD.